$5 Free Account Credit - Use link to sign up, no need to enter coupon code! *Must click here to activate coupon! 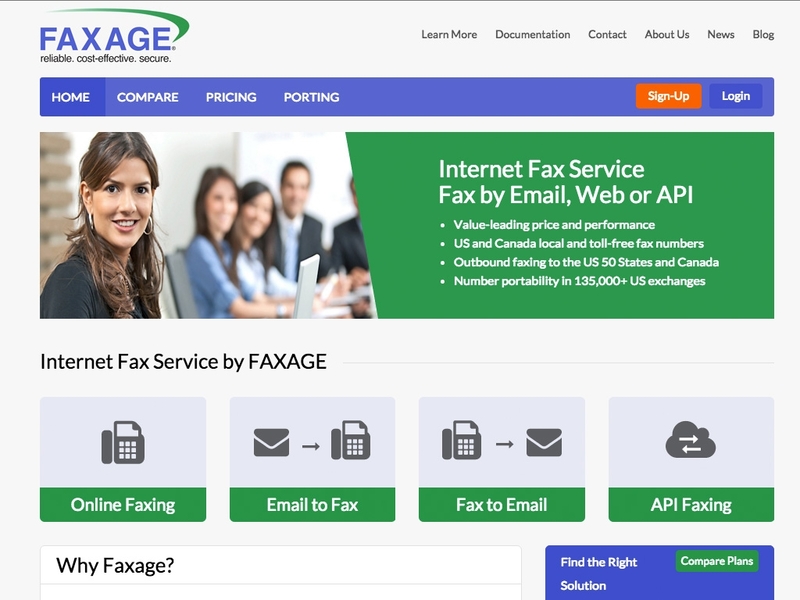 FAXAGE offers email to fax, fax to email, and web based faxing with a focus on price and performance. 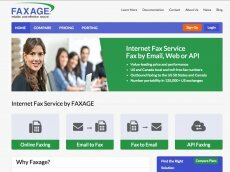 FAXAGE primarily serves small and medium business markets by offering Internet fax services designed for multiple users with multiple fax numbers on a single account. The service also offers a scalable, wholesale Fax API service for large enterprises and ITSP or VoIP carriers who resell the services as their own branded electronic fax offering.The email fax, online / web fax, and API fax interfaces are available to any account, regardless of size. This makes FAXAGE a flexible electronic fax solution that can be tailored to business process requirements. FAXAGE also features industry-leading security options including SSL/TLS transport, PGP security and password-based security for faxes. FAXAGE strives to be the recognized value leader in Internet Fax by offering the best balance of price, quality, performance and features in its space. If you use or have used FAXAGE in the past, please share this page using the buttons above and be sure to leave a rating and review of the service so other people can make an informed buying choice based on your experiences! It's free and you are not required to register! If you have experience with FAXAGE, we kindly ask that you please share your thoughts with others on this website by submitting an honest, detailed review. Your feedback will help prospective clients decide which service provider to choose and is incredibly valuable to the community itself as well as FAXAGE's representatives that read this website. Please do not use this form for support inquiries. Be aware that these reviews may also be syndicated and displayed on FAXAGE's website, and as such a strict review policy is in effect. All reviews are moderated prior to being published, and reviews that do not contain concise, detailed comments or do not support their associated ratings will not be published. We urge you to be as detailed as possible when leaving feedback, as FAXAGE may also use this information as feedback for their business and are themselves encouraged to reply to reviews posted to their listings. How many times has the service failed? If never, please rate a 10. Do you feel the service is missing features? If it has all the features you need, please rate a 10. How easy is the service to use? If you have never had a problem, please rate a 10. How helpful and efficient was Customer Support? If you have never used customer support, please choose No Rating. How satisfied are you with this service? If you are completely satisfied, If you have never had a problem, please rate a 10. I am a solo therapist in a busy private practice and time is not something I have a lot of. I came across Faxage because of issues with my previous provider. FAXAGE made the switch easy and were in consistent communication throughout the transition. Each person was helpful, knowledgeable, able to answer questions and provided regular updates throughout the process. I wasn't left searching for a way to find out what was going on and was always provided with accurate information. The transition was seamless and I was up and running quickly. I can't say enough good things about their service! What a relief to know that I'm in such good hands without having to pay an arm and a leg for the service! Started out with the service by calling customer support with a few questions. They answered my call immediately and were very helpful. The fax service so far is great, very inexpensive, no complaints at all. I have tried a few fax services over the internet but I have to say Faxage is the best one I have ever used. It is very user friendly, fast and very efficient. Its great not to worry about having a phone line and paying extra costs just to be able to fax out at anytime and to also receive faxes as well. Thank you for the great service and I have and will highly recommend your business to anyone and everyone. FAXAGE IS FRICKING GOD SENT AND SOOO AFFORDABLE. THANK YOU GUYS. I’m thrilled to find FAXAGE! The cost is more than reasonable and the quick customer service response is top-notch! I am a therapist with a solo practice who also needed a reliable faxing solution that met HIPAA compliance standards. FAXAGE seems to be the perfect fit for my solo business! Who would have thunk it! My colleague told me about Faxage and I was amazed that I could fax by email.......what a convenience! I had gone out and bought a copy/scan/fax machine and realized I didn't have a phone jack in my office (another amazement). I had been going to Fedex for years to fax occasionally, spending quite a bit of money to fax. Then my faxing increased, thus buying the machine. Sooo, all ends well...Faxage to the rescue! Easy peasy set up for computer illiterates as myself and I was faxing away. Thank you Faxage!!! Faxage is exactly what we were looking for. We are a new and small, but growing, counseling practice. We need a fax service that provides the flexibility that an online system offers while also having procedures in place for HIPAA compliance. The price point is perfect for our low needs at the moment, while still providing affordable options that we can upgrade to as we grow. Being able to add individual users in a benefit that we hadn't thought of when we signed up but has turned out to be quite useful. It was very easy to get signed up for and to personalize all our settings. We've been using if for about 3 weeks now and have found the site to be very user friendly and have not needed to call upon customer support. I was afraid to sign up with a fax service because it's usually so expensive and sometimes it's a pain to use. I really wish I had discovered Faxage years ago. It's extremely easy to use and really affordable. I guarantee if you Google fax services and look at prices, if they even list them, compare and see that if you are using another service especially one of the big guys, you are getting charged more than triple for Faxage. Very satisfied overall. Simple to use. Would like an easier way to cc: multiple numbers on the same fax. Ease of use, and at a very competitive price. So far, the service is great and at a great price. The other fax service i used was more money and their interface wasn't as easy to use. Making a transition from my own machine. So far I am very happy. I am just starting out with this service and so far, it seems cheaper than other services and is user friendly. We were looking for a HIPAA compliant service that didn’t charge an extravagant amount. Glad I found them, affordable and easy to set up. I purchased the service in order to easily send faxes via online portal and avoid having to maintain a phone line and fax machine in my home, send/receive faxes via a HIPAA complaint fax service, and to communicate to those few entities who still only do business via fax. All of my interactions with Faxage Sales and Support have been quickly resolved to my fullest satisfaction. Keep up the great work! They were able to port a number that we were not able to remove. They have been wonderful in our setup. I like how user friendly the site is, I have sent out directions for use, and had 0 questions back.